Happy April Readers. It is time to start this month's What are You Reading RIGHT NOW! Challenge. It is simple. Just tell us about the books, magazines, poems, etc. you are reading. The Mom has grown to LOVE this Challenge --it always improves her reading list! Here are of few of the titles The Sisters are reading RIGHT NOW! in case you want to read it too. 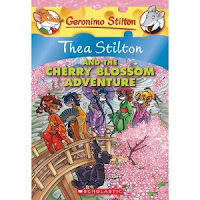 Blossom Adventures are great fun. And when you finish your book come back and tell us all about it. Take a challenge, or two, or ten! Today (April 7) is The Teacher's Birthday! 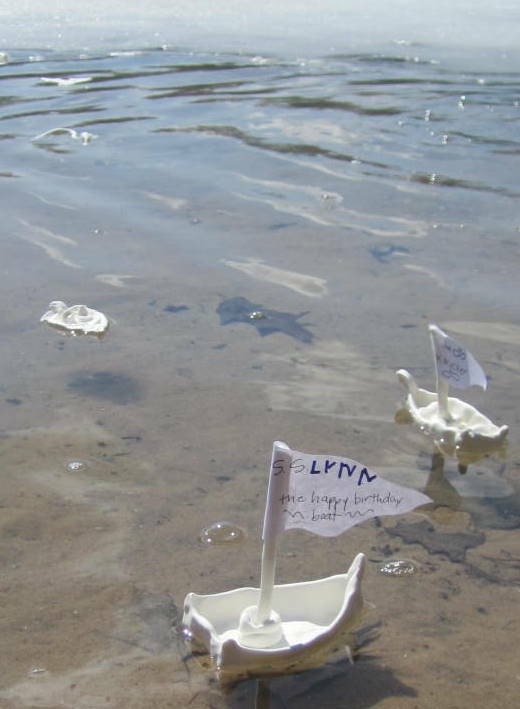 We are sending sent a tiny regatta of freshly made boats out onto slowly thawing Turtle Lake in her honor. Happy Birthday Dear Teacher and thank you for helping to make the BFWP so wonderful! Please use the following format for your comment: Title of Book, Author, and your thoughts on the book. The MOM is typing for me!! Mr Putter and Tabby Series -Mr. Putter is very funny. "Last night when mom and I were reading we were laughing SO HARD!" 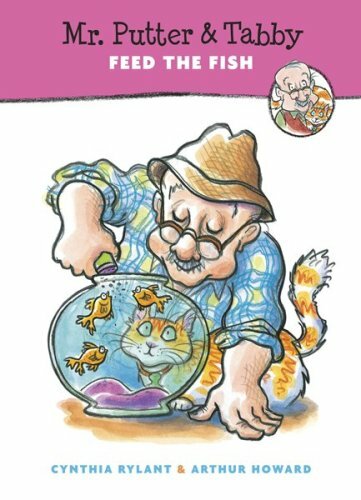 If you read Mr Putter and Tabby Feed the Fish you will laugh at, "BAT, BAT, BAT" it is what Tabby does to the fish bowl!!! We are also reading Little House on the Prairie series! I love the illustrations and there are activities and lots of history of dragons in it! It is hard to explain -it is so good. 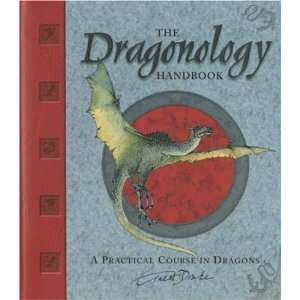 The book makes me WISH that there are dragons NOW -but they didn't kill people, that they would be vegetarians and you could keep them as pets! I have a confession to make. I start WAY too many books at a time. When I hear about a good book, I immediately check the library to see if it available -current best sellers are usually on a bit of a waiting list-- so I want to get in queue. BUT there are weeks where my plan backfires, I get a notice from the library that a BUNCH of books are in for me. Being the dreamer that I am I begin them all. Right now I am about 3/4 the way through Let the Great Wold Spin by Colum McCann -The Bean suggested it-- it is wonderful, but it is due back at the library tomorrow. So I really should be reading rather than commenting! And along with The Big Sister's new treasure --her own copy of The Dragonology Handbook-- UPS delivered a bunch of other treasures, but we are not officially READING them yet-- we'll post as we begin! Thanks for sharing all the GREAT Beverly Cleary stuff! I spent a few hours reading Ramona age 8 OUTLOUD to my kiddos! And they were happy. That is what we are reading right now!!!! I love the Mom's confession because I have the same behavior! At the moment though I just finished The Paris Wife with some focussed reading for NWS tomorrow, and now am splitting time in the food world reading Tender at the Bone by Ruth Reichl and wandering hungrily down memory lane in Chapel Hill with Cooking in the Moment. Clearly I'm ready for spring! Also at our house right now: Dad-Cutting for Stone, Daughter- The September Society, Son 1- Eldest (again) and Son 2- The Howliday Inn. Hope you've had a great library week! I could not imagine life without writing, reading or composing poetry! Unthinkable! I am finishing up the Redwall series by Brian Jacques...very thrilling and 'on the edge of your seat' kind of book! ALMOST as good as The Lord of the Rings by J.R.R. Tolkien...OBSESSIVE! The book I am writing at the moment (when I'm not working on the other 6!!) was inspired by Tolkien's works! just finished actually. SUCH a touching book. It is definitely on my favorites list! I am with you, The Mom - I am always in the middle of several books, and my kids have inherited this behavior from me. I am about to finish "Simplicity Parenting" (wonderful! ), and I've just started "The Happiness Project", and "Last Child in the Woods". My sons and I are listening to "Once Upon a Curse" from the 'Frog Princess' series (lots of fun), "Harry Potter and the Order of the Phoenix", and a "Hank the Cowdog" book on CD. And as a family we're reading "On the Edge of the Dark Sea of Darkness". The Danger Box Blue Balliet --author of Chasing Vermeer, The Wright 3 and The Calder Game The Sisters loved these three but the description of Danger Box seemed a little dark so I am reading it first! Gossamer by Lois Lowry --continuing my way through Young Adult Literature. Just started it and I like the idea of little beings that help us through life by giving us dreams. On another Lois Lowry note: I just learned that The Giver is first in a trilogy I am really excited to read the other two... will let you know! I am pre-reading The Ominvore's Dilemma Young Readers Edition by Micheal Pollan --I read the adult version years ago and simply loved it. Once I finish it I will pass it along to The Sisters for their shelf. So far, very good! Happy Earth Day and Happy Easter!! I am reading Louise Erdrich's A Plague of Doves. I hadn't read Erdrich for quite some time but read an interview with her. In that interview, the interviewer mentioned that Philip Roth wrote to her after Plague of Doves came out and told her he thought it was her masterpiece. This got my attention, so I went to my local bookstore and got a copy. It seems quite wonderful so far. Of course, Erdrich is still writing, so her true, true masterpiece may still lie ahead. Stay tuned, Phil.